Scheuermann Brewery Warehouse, Calumet, Mich. Although the Copper Country cannot be compared with many of the rip-roaring towns of the gold rush, it was far from a dry place. In 1910 Houghton County boasted 179 saloons for its 88,000 residents. Not to be outdone, Red Jacket with its population of 40,000 contained 100 bars around the turn of the century. At about the same time a case of quart bottles could be bought for one dollar. From the beginning, mining companies banned liquor establishments from company property, but did little to stop it in neighboring villages. Soon brewerys and taverns began appearing all around this region during the middle of the 1800's. In 1857 William Ault developed one of the first brewerys in the Keweenaw. This brewery was sold on his death in 1863 to Philip Scheuermann, Frank Maywood and Adam Youngman and was known as the Philip Scheuermann Brewing Company. Originally known as the Union Brewery it was located just west of Houghton on the Portage canal. Developed in an area where natural springs produce some of the nation's cleanest water, the operations were run by Mr. Scheuermann who bought out his associates in short order. Philip Scheuermann was first a carpenter in Eagle River in 1850 and later became superintendent of Quincy's first stamp mill on the Portage. He took on brewing and continued until his death in 1898. The quality of Scheuermann's was known to be better in the winter when their brewmaster was able to keep up with demand and give the beer time to ferment properly. Upon the death of Mr. Scheuermann the brewery became part of the Bosch Brewing Company and from that point was better known as the Scheuermann Branch of the Bosch Brewing Company. 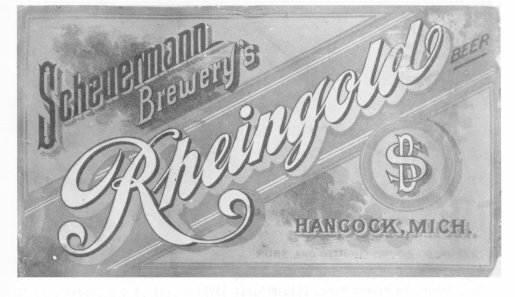 As was true with many of the Keweenaw's brewers, Scheuermann's ended brewing with prohibition in 1918. Sometime after 1933 Bosch Brewing moved their entire operation from Lake Linden to the Union Brewing (Scheuermann's) site. This site outlasted all other Keweenaw brewers, brewing Bosch and Gilt Edge brands, the later being a white bottle wrapped in green tissue paper. Bosch was known to everyone as the beer "Brewed in the Sportsmen's Paradise." The last keg of beer in the Keweenaw was made by Bosch in September 1973 and was delivered to the Schmidt's Corner Bar (a favorite old haunt of mine). "We're so far up here, it cost so much to bring materials up here, and then there's not enough people to drink it" is still a common complaint of many businesses in the region. Until 1891 the laws regarding the brewing, bottling and distribution of beer were very complicated. A brewer was required to keg all of his product so that the proper tax stamp could be affixed. The keg then had to be transported over a county road to a separate bottling facility. In the early days of transporting beer, Bosch needed four strong teams to haul their beer up the hill from Lake Linden to Calumet. It was trying even in the best of times. All of this information may help in understanding why this building was constructed. 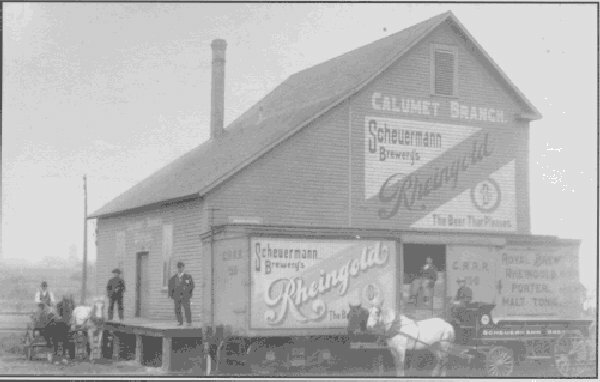 The Calumet Branch of the Scheuermann Brewery was located in Calumet, in the shadow of the C&H shafts. Obviously,not a brewery or a bottling plant, this was a warehouse used to ship product mainly to another warehouse further north in Mohawk. It doesn't completely explain why it was built but one has to wonder, why build such a small warehouse. It doesn't look like more than two box car loads could fit inside. Did they have to do this to comply with the law? I'm not certain but it makes a perfect structure for a model railroad. I have not been able to locate a photo of this structure without the box car in front of it so I had to guess at the warehouse door arrangement. The prototype photo must have been taken after the business was bought out by Bosch as the Copper Range box car tells us that it is at least 1900. The car, CRRR 150, was the last car in the second series of box cars on the Copper Range, purchased in 1899. This car appears to be hand lettered and is a boxcar not a reefer. The hand lettering says "Royal Brew Rheingold Porter Malt Tonic". Four or five of these types of cars were owned by Scheuermann, mainly to move product from L'anse to Ontonagon and from Calumet to Mohawk. I have identified COPR 118 (first series of Copper Range cars) as another Scheuermann car, for those interested in being exact. Bosch also maintained a few cars which may have traveled farther due to the success of Bosch Beer. I am not sure if the Bosch cars were also Copper Range, although I would like to find a picture so I could model both types. Thanks to a book by the Copper Country Bottle Collectors called Old Bottles and Jugs of Michigan's Copper Country, I was able to faithfully reproduce the Scheuermann's sign on my model structure and the Copper Range box cars. This goes to show that you can find information on your prototype from all kinds of unusual sources. The label is slightly different than the one on the building but signs change and I thought this label would have been from a bottle produced towards the end of the company's existence, possible 1918, closer to the year I've set my railroad in. In order to reproduce the sign I started by reducing the sign to 20x11 scale feet on a copier and made multiple copies. I cut out the white triangles on one copy and used this pattern to paint the front of the structure. I used Box Car Red and Antique White for the sign. I took another copy and placed it underneath a piece of blank decal film. This was then placed on a light table and the lettering was carefully traced from the original onto the decal. I finished painting the rest of the front face and then sprayed a gloss coat over the entire face. After drying I applied the decal over the pre-painted area and applied Solvaset in order to get the decal to sink into the clapboards. This is a one-shot attempt, as with a decal this large you have to lay it down right the first time. Lay the decal exactly over the sign and slowly slide out the decal paper, and leaving the decal in place by holding it down at one end. The face was then weathered with an india ink and alcohol solution, left to dry and sprayed with Dull Cote. The Calumet Branch was changed to the Lake Mine Branch as that is where it will reside on my railroad. 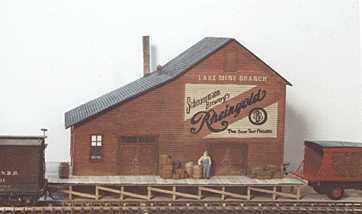 This lettering and the lettering on the side of the structure which says "Calumet Branch Office", or Lake Mine in my case, was done by painting the area around the lettering Antique white, letting that dry and applying dry transfers. This was then painted over with Box Car Red and left to dry. The dry transfers were lifted off, with tape, to expose the Antique white which matches the color of the Scheuermann's sign. The windows and doors are nothing special, just ones I had lying around that looked like the prototype. The front window is barely visible in the prototype photo, but it was the same size and placement as the side windows. The doors could not have been higher than these windows or you would be able to see them as well. The louver at the roof peak was made by cutting out the clapboard and flipping the cutout section upside down and adding strip wood to represent the trim. It looks like a louver and is very easy to make as it would have just been scrap wood for the scrap box otherwise. The platform was built board by board using 2x12's and 4x4's for the legs, and weathered with an india ink and alcohol solution.